In the Ricardo Effect, Hayek’s chief contribution to the Austrian business-cycle theory (ABCT), the turning point in the cycle from expansion to recession happens when the makers of consumer goods and services employee more workers and buy less equipment. Equipment makers face plummeting sales and rising costs for materials and labor, and therefore a profits squeeze. So they cut back on production. Signs of that may have appeared in New York. 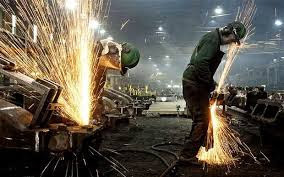 The New York Federal Reserve released its August 2015 Empire State Manufacturing Survey reporting that the index fell to -14.9, its lowest level since 2009 in the depths of the latest recession. Naturally, economists had expected the number to be +3.86. A positive number suggests growth ahead and you can guess what negative numbers mean. New orders for manufactured goods fell to -15.7 while shipments of finished good declined to -13.8 and inventory levels dropped to -17.3. The Fed has analyzed the index as a proxy for the future of the economy as a whole and claims that the survey "potentially offers significant information about trends in U.S. manufacturing production and employment," and is at least as good as the surveys by the Institute for Supply Management and the Federal Reserve Bank of Philadelphia’s Business Outlook. According to the Investopedia article on the survey, the ISM survey indicates a modest slowdown while the Philadelphia one confirms the Empire State survey. Most financial pundits will dismiss the manufacturing surveys because manufacturing makes up only about 12 percent of US GDP. They dismissed the fall in oil prices for similar reasons. But keep in mind that the highly stylized GDP figures report only about half of the economic activity in the country because its creators wanted to report only new output net of most costs. The BEA has added a new series called Gross Output that doubles the size of manufacturing in the total economy and more clearly reflects reality. At the same time, the energy and manufacturing sectors are not islands in the economy. Suffering in those sectors indicates that their customers are hurting and the slowdown will hurt their suppliers. As they lay off employees, sales of consumer goods will begin to decline. We can look at the economy as the Mississippi River flowing from raw materials to finished consumer goods. Raw materials producers are at the headwaters in the north of the US and retailers at the delta outside New Orleans where the river empties into the Gulf of Mexico. Manufacturers are in the middle transforming raw materials into capital goods and consumer goods. Shipping companies are the barges plowing up and down the muddy river. A drought in the upper regions of the river will not show up immediately in New Orleans, but eventually the river will run shallower there. We have watched for months as the energy and minerals sectors have crashed and hurt the economies of commodity exporting nations such as Brazil, Russia, Australia and Canada. The Chinese dragon, the consumer goods supplier to the West, is in the hospital. In the US, the collapse in oil prices is hurting Texas, Oklahoma, Montana, Colorado and the Dakotas while Caterpillar has endured years of declining sales. All of those industries employ vast numbers of services, such as accounting, engineering and law firms as well as use hotels and restaurants. Trucking, rail and ship transportation is woven into the fabric. It’s only a matter of time before the drought reaches New Orleans and shows up in the GDP. Talking heads in the media will scoff at the recent sell-off in the stock market, claiming that the market is out of touch with the real economy. They don’t seem to know that the market is forward looking and is trying to tell us where it thinks profits are headed. Of course, most of them probably sold their stocks at the bottom of the last bear market and only recently got back in.